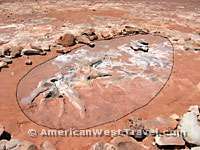 The Painted Desert of northeast Arizona is covered by the “Chinle formation”, a very soft layer of earth consisting mainly of mud, sandstone, and volcanic ash. This material is conducive to the preservation of fossilized artifacts, specifically from the Triassic Era of 220 million years ago. The most spectacular and well-known fossils are the remnants of petrified wood protected at Petrified Forest National Park. During the late Triassic Era, this land was humid and tropical, located near the equator. The area of the national park was a large river system with a huge conifer forest (which ultimately became the Petrified Forest). The late Triassic was the dawn of the age of the dinosaurs but it was a time when large reptiles and amphibians dominated the landscape. During the 1980’s scientists discovered Coelophysis (left) here at the park. At the time it was thought to be the first dinosaur to walk the earth. 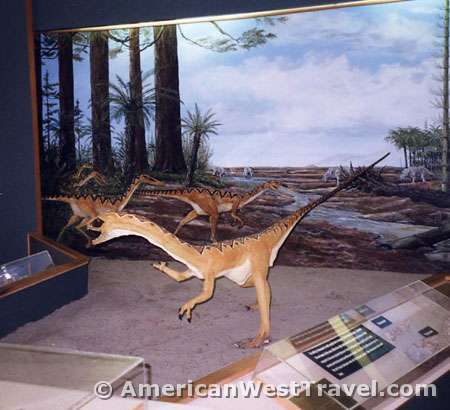 Older dinosaurs have since been discovered elsewhere but Coelophysis remains one of the earliest. 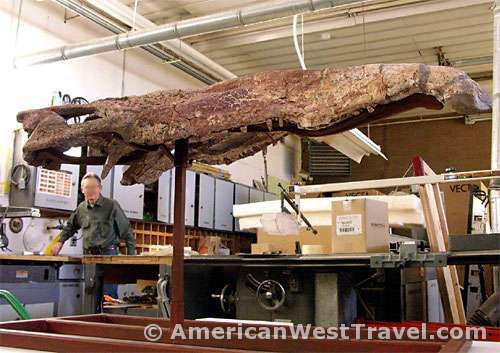 However most animal fossils found at Petrified Forest are reptiles, amphibians, fish, and invertebrates. One of the reptiles whose remains are found here is the crocodile-like Phytosaur. This ferocious predator had bony plates and a jaw full of sharp teeth and could reach a length of forty feet. Like crocodiles, to which they were distantly related, phytosaurs lurked in the water, making a diet of fish or land animals which came too close to the water. In 2005, Petrified Forest National Park is participating in an exhibition at the Department of the Interior Museum in Washington, DC. The huge phytosaur skull [Photo, left] will be on display for the year, then returned to the park’s Rainbow Forest Museum in 2006. This particular fossil was discovered in 1985 and excavated a year later. Another reptile which once lived in Petrified Forest National Park was the aeotsaur. These creatures grew up to fifteen feet long and were “armored-plated”. The small-skulled aetosaur had a piglike snout for rooting in plants or possibly digging up insect mounds. Some species had spikes on their backs. The “armor-plates” were actually thick pieces of bone which covered the aetosaur. A single animal had about one hundred plates in four rows. These thick plates are rather common fossils from the Triassic Era. However they are generally found scattered; a whole aetosaur skeleton is quite rare. 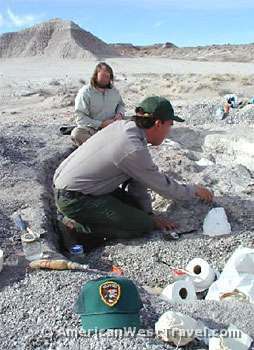 In March 2002, an aetosaur dig was conducted at the park. The photo at left shows paleontologists working at the excavation site where part of a fossil skeleton was found. Several strange species of fish have been found in the Painted Desert area, including fresh water sharks, lungfish, and coelecanth which is still found in the world today. 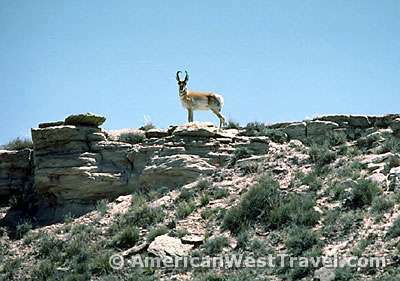 At left, a modern day animal at Petrified Forest, a pronghorn. Petrified Forest National Park offers supplemental information on their ancient animals. Read their site bulletin on “Triassic Dinosaurs and Other Animals” or read more about Fossil Discoveries in the Painted Desert.